This collection combines strength, durability, comfort and	versatility with a unique blend of classic and contemporary design features. 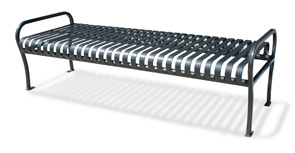 Manufactured of 3/16" x 1-1/2" ribbed steel with a zinc-rich primer and wide range of durable, long-lasting powder-coated finishes, these benches will fit into any decor. All models are available in the	powder-coated finishes shown.